Beta Moms still want their kids to be successful, but they don't believe that helping their kids reach their goals necessarily involves overachievement or keeping up with what other people define as "norms." In their efforts to adjust to the myriad challenges and stressors in their lives, many moms are beginning to believe that it's more about balance than perfection. Beta Moms’ hair may not always be perfect or their homes spotless, but they’re okay with that. For many, their lessened anxiety makes it all worthwhile. They’ve liberated themselves from feeling the pressure to do it all, and now they believe that as long as their kids are healthy and happy, they don’t need to. Beta moms...slackers and proud of it. Are you with me? So Emmitt absolutely loves the phone. Understandable, of course...I mean it's something you hold in your hand and voices magically come out of it. And unlike the Elmo remote control he has, the words and voices are different each time you use it. What's not to love? So I shouldn't have been surprised when I was working in the living room this morning and my mother popped up on Instant Messenger. Well, no, actually I didn't know. So I headed out to the porch where sure enough, Emmitt was standing there watching some cartoons with the phone pressed to his face and I could hear my mom talking through the receiver to him. Of course unlike Nora, who talks your ear off, Emmitt only says "uh-huh" when he's on the phone. When I asked for the phone, he said "no" ran into the play tent they have. I peeked in there in time to see him press a few buttons and laugh hysterically. Once I got the phone, mom told me the story. Apparently her phone rang and she picked it up assuming I was calling to chat about the conference, since we'd been working on sponsor pitches this morning. Instead, she got the sound of Jack's Big Music show. Now safe guess would have been Elnora, since she loves to call the grandmas and talk. But when Nora didn't answer, mom figured it out. Mom: Is that you Emmitt? Mom: Are you watching cartoons? Mom: Did you have breakfast today? Mom: What did you have for breakfast? Overall, I guess if he was going to steal the phone and make a call, he did good. Better than having the pizza man or the police show up at the front door, right? One of the things that has really amazed me about watching the kids in the last six months is the sibling relationship that forms. Yes, I know that often means tears and fights, but it also means some of the most heartwarming (and hysterical) things you'll ever see. Elnora's three and a half right now and Emmitt is twenty months. While they do their share of fighting, they mostly get along really well. In fact, I've seen a few really awesome things this past week. 1.) We learned Emmitt can count to ten! This is impressive since Elnora only learned to do it a few weeks ago. Apparently Emmitt picked up on all her practice. Very cool how the little ones learn from the older ones. 2.) Elnora wants nothing more than to "play with Emmitt." When he naps, she sits around asking when he's going to wake up. The second she hears him, she races into his room, climbs into his crib and they "jump" together. 3.) Emmitt wants nothing more than to make Nora happy. He's always trying to share things with her or do things that will make her smile. Yesterday, she lost her stuffed elephant (her favorite) and was running all over the house trying to find it. In a matter of moments Emmitt came trucking into the room, holding Elephant and sporting a huge grin. He ran up to Nora and handed elephant over. Nora responded with a "thank you!!!" and a big hug. Too cute. Either way, I guess it's like everything else with kids. They're either making your heart melt, or your head asplode. 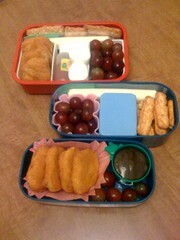 These were the kid's bento lunches for school on Tuesday. The top one is Elnora's. It's a single tier box with some divided compartments. By far my favorite box and the one you'll pretty much always see me packing for her. The very top part has a string cheese nestled under some Keebler Honey Wheat cracker sticks and a tiny little fork. The left side has some chicken nuggets lined up. The center holds a small bottle of ketchup and two marshmallows. the right side is stuffed with baby red grapes. The two tiers on the bottom are part of the same box. They stack up and there's a band that goes around them. While it looks huge, it actually doesn't hold much moe volume wise than Nora's box does. The top tier holds a string cheese, grapes, cracker sticks and a container of ketchup. The bottom tier holds some chicken nuggets, some more grapes and one teeny, tiny, baby cupcake from a Hostess 100 calorie pack. Is My Brain Full...or is it Empty? I always thought the biggest challenge of being a mom was going to be time management. How in the world would I get everything done? How would I put in my hours at work, do the grocery shopping, pitch in with the laundry and cleaning, cook the meals, pack the lunches, maintain some relationships AND care for children full time? And there's some truth to that. While having a baby was exhausting and having a baby AND a toddler was even more exhausting...it was nothing compared to having a toddler and a preschooler. I find myself constantly behind on everything. There's always a stack of laundry, always dishes to be washed, always floors to be swept and rooms to clean. Always books to be read, boo-boos to kiss, kids to put to bed, kids to hug, kids to blow bubbles with. I mean I didn't exactly have a lot of free time BEFORE I had kids. How in the world would I expect to have any with two of them running around? That's not to say I don't love them dearly or thank God 'round the clock for blessing us with them. But lately, I've noticed it's not the time management "thing" that gets to me. It's my brain. I work a creative job. I'm a writer, an educator. It's my job to come up with something new and interesting to say each and every day. To develop new ways to introduce old concepts in the hopes that someone who never "got it" before will "get it" now. This means my brain is supposed to be going constantly. And it does. My, how it does. What I'm finding though is that instead of traveling down a path...it seems to go more in circles these days. For example: I have a stack of 9 marketing books sitting on top of my television. They've been stacked there for...five, maybe six weeks. Each and everyone of them contains things that interest me, that will make me think, that will work my brain. Yet I can't bring myself to pick any of them up. I hop online sometimes after hours and I find I spend more time refreshing Twitter and looking at who is on GTalk so I can chat for a bit. Often, I'll head off to read through some blogs or look up some topic, but I find myself getting bored and my mind wandering off before I get very far. So all this leads me to wonder...is my brain "full" or is it now "empty." Have I shoved it with so much information and spent so much time thinking and contemplating that it's begging for me for a rest? Or, have I spent so much time doing the same things over and over and getting used to 140 character sound bites that I can no longer absorb complex thoughts? In other words, is my brain is sadly empty. I remember back before I had kids...reading about the women who didn't want to have kids and stay home because "I need mental stimulation..." or some load like that. I sometimes find myself wondering how I can get LESS mental stimulation. Nonetheless, it all leaves me wondering... what's going on with my head? Am I giving my brain too much stimulation and need to chill out a bit? Cut out what little TV I watch? Turn the radio off in the car? STOP trying to read books? Just chill? Or, is my brain running in circles because it's desperate for a DIFFERENT kind of stimulation? Meaning I should be pulling out some of those old "make you think" books I used to love? I read Stephen Ambrose's "Undaunted Courage" about a month ago and that seemed to give my brain a brief respite. I don't know if it's because it was a different topic, or because it really was steeped with a lot of "make you think" type content. I know I'm not the only one of us who has run into this. So please, dear readers...share with me your insight. When your brain gets into this "running in circles" mode and you find yourself being decidedly unproductive...what works best to get the gears turning again?